Tehran | A group of Russian archeologists working on a dig site in western Iran has made what could be the greatest discovery in decades. They have unearthed a total of six humanoid skeletons belonging to individuals that seem to each have measured more than 5 meters high. The scientists responsible for the discovery have not yet pronounced themselves about whether these were the remains of excessively gigantic and oversized homo sapiens, or the first specimens ever discovered of a brand new species of proto-humans that could have coexisted with our ancestors. Andrei Asimov, professor of archeology and paleoanthropology at the University of St-Petersburg and researcher in charge of the excavation site, explains that this discovery could explain many stories that were until now dismissed by historians as simply mythological. “This means that Goliath and his fellow warriors from the mythical city of Gath could really have been more than 3 meters tall,” he tells our reporter. 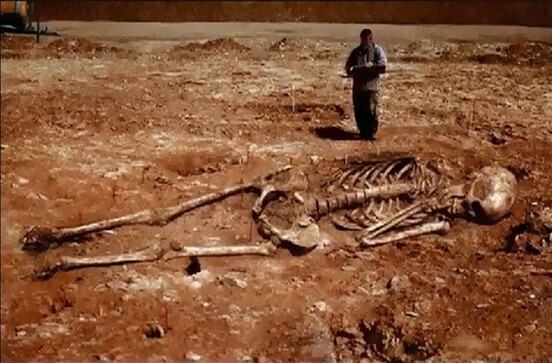 3 Comments on "Iran: Archeologists Discover 5 Meters Tall Human Skeletons"
The credulous mideval mind is still here especially in the middle east the american south and in certain disturbed presidents. Of course there are Giants…Haven’t you heard of Eli Manning?